I really like the sock and the yarn! Lovely!!! Yep, he's a keeper! I agree that your boyfriend's a keeper. It's in my job description.Indeed. He does have excellent taste. 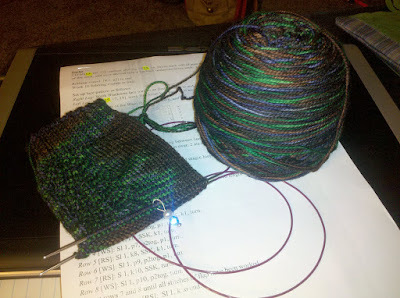 The yarn looks lovely and sounds luscious but you are right about the probability of holes. There is some stuff you can knit in along with main yarn just for the heel that strengthens it but I can't remember what it's called. It's not a knitting fiber per se. I will see my friend who told me about it and ask her tomorrow and let you know.